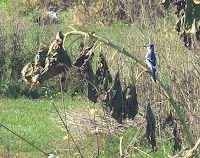 Life by the Creek: Blue Jays! Yesterday was a beautiful day. 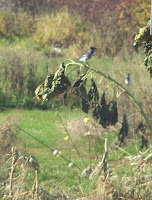 We had planted some sunflowers along the edge of our garden, and we noticed some Blue Jays taking advantage of the seeds. You can see the other one in the background. 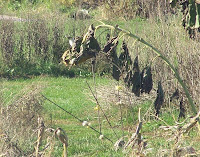 They took turns, and kept coming back to the same plant. I guess it had the tastiest seeds! I love Blue Jays. I know they aren't the friendliest birds, but they are so beautiful. 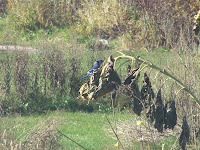 I love blue jays, too. They are pretty, but I didn't know they were mean! Standoffish, I guess? Or do they pick on other birds? Ha! The word I have to type is "hotstr", which you could totally make seem like it's saying hot sister.